Little Farm in the Foothills: The Goonies Anniversary Celebration inspires a new story for tweens! The Goonies Anniversary Celebration inspires a new story for tweens! I first got the idea for the story when I came across a newspaper article about the writer visiting a grown-over graveyard. He stumbled upon a girl's gravestone that read, "Forget me not, is all I ask." Later, he saw a photo of that same grave...and in the photo was the ghostly outline of a young girl. I was further inspired by memories of a friend's home when I was a kid in St. Cloud, Minnesota. The house had little passageways between the bedrooms! Since I'm a big fan of The Goonies movie, all the Victorian homes, historical sites, and fascinating nooks and crannies of Astoria, Oregon sealed the deal...Morgan, the main character of my paranormal series for tweens, needed an adventure where The Goonies had been filmed! While I was writing the book, I was also reading Anne of Green Gables. I was so taken by the sweetness and innocence of that story, that I wanted to reflect that simpler time in my new book. 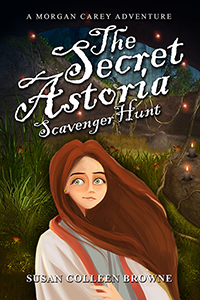 A tale that also touches upon the ways kids find their place in the world, The Secret Astoria Scavenger Hunt is available in print and ebook on Amazon!